"The pain I feel reaches the depth of my heart, the guilt I feel is so overpowering that I cannot find any place to hide, and the remorse I feel has slashed my heart into pieces," Lu Wei, former head of the Cyberspace Administration of China, said in his handwritten letter of remorse now on display in Beijing. The letter of Lu is among several other exhibits showing the results of anti-graft campaign, part of a major exhibition commemorating the 40th anniversary of China's reform and opening-up. The 58-year-old Lu, also the former deputy head of the Publicity Department of the Communist Party of China Central Committee, mercilessly berates himself in the letter. "I've made unforgivable mistakes in terms of politics, economy, work and life. I severely deviated from principles and crossed the line of ethic as a Communist." "I seriously violated the six critical points (politics, organization, honesty, the masses, work, life)... The scale, depth and severity of my mistakes have brought tremendous harm and shame to the Party." In the letter, Lu also mentions his wife and son. "The style of my life hurt her much and we quarreled often. In despair, she once said in grief and indignation, 'I can't manage you. But sooner or later, the Communist Party of China will.' Now what she said has turned out to be true." "My son has just celebrated his 30th birthday. I was not a good role model for him; neither did I take the responsibility of a father." The exhibition opened at the National Museum of China on Tuesday and showcases a wide range of sectors, including the economy, technology, environment, culture and education. It presents the country's 40 years of development and the changes in people's lives. The exhibition saw more than 31,000 visitors on Wednesday, the museum said. 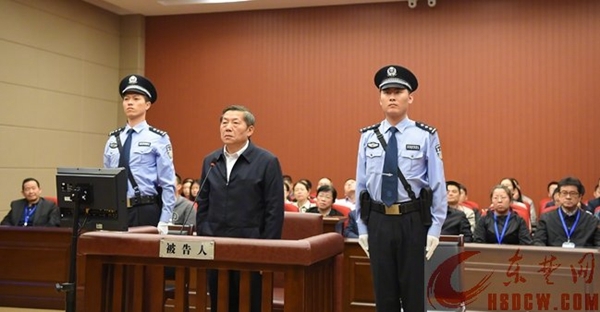 Lu pleaded guilty in October to accepting bribes of more than 32 million yuan ($4.6 million). A sentence is pending. Lu was expelled from the Party and dismissed from public office in February. The letter of Lu Wei is among several other exhibits showing the results of anti-graft campaign, part of a major exhibition commemorating the 40th anniversary of China's reform and opening-up.